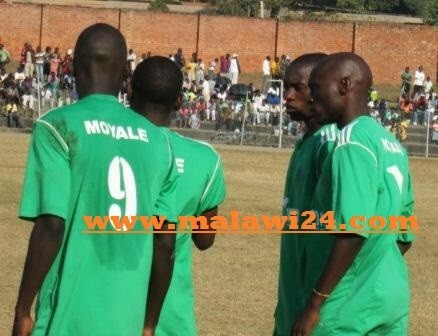 Lloyd Njaliwa’s first half strike was enough to hand Malawi’s Mzuzu city based Moyale Barracks a 1-0 win over Azam Tigers at the Kamuzu Stadium on Sunday afternoon. Moyale Barracks started the game very brightly and they were pressing the Tigers players high up the pitch and attacking at a fast pace, which caused the Tigers defence all sorts of problems in the opening minutes of the first half. The Kaning’ina soldiers kept on pressurizing the Tigers defence and their hard work paid off in the 12th minute when they scored the opener through a bullet header by Lloyd Njaliwa. Moyale Barracks: Won against Tigers. The goal came after the Tigers keeper failed to cut a nice driven in cross which was played by Khuda Muyaba. After that goal, Moyale kept on pressurizing Tigers but the home team’s defenders had now learnt their lesson. As the first half was going to an end both Azam Tigers and Moyale Barracks could have hit the back of the net but they all lacked the killing composure. Come second half, both teams started on a high intensity as they were both looking for goals but they all failed to score. Tigers coach Gerald Phiri brought in Patrick Thupi in the second half who completely changed the game for the Kau Kau boys and forced Moyale Barracks to start delaying tactics. Thupi’s excellent passing football could have helped Tigers to find the back of the net after he released a Tiger’s player in the box but Moyale Barracks goalkeeper Juma Chikwenga was equal to the task. Azam Tigers kept on pressurizing the soldiers in the dying minutes of the second half but Moyale Barracks defended jealously and the game ended 1-0 in favor of the Mzuzu based soldiers. The win has pushed Moyale Barracks to position 7 on the table whereas the loss has moved Tigers to position 8. Azam Tigers are the only team in the Super League which is yet to register a win in the second round of the league having failed to get maximum points in their last 10 matches. Mikango Imeneyi Yimandibebera Bwanji! More Fire Lions Of Kaning’ina!